A brief read about the name. Here's some of the information and links concerning the Wingless Spec Sprint (WSS, or Wingless Sprint) division at Antioch Speedway. Also links concerning the NCMA, Orland Raceway Wingless Sprints, Central State Racing Assoc' (CSRA) Wingless Sprints, Twin Cities Speedway Speedway Sprint Cars, Watsonville Speedway Wingless Sprints, and Chico/Placerville Speedway's Spec Sprints. Dennis Daniels is the web master of Antioch Speedway's web site. 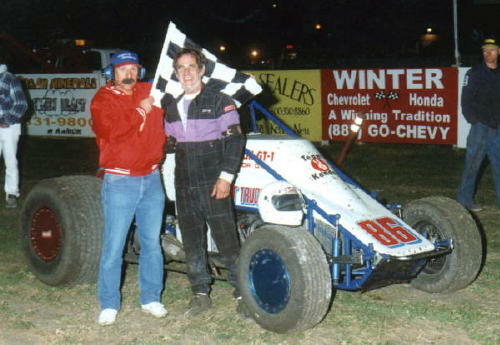 The late Darryl Shirk was one of the 1st to support the(WSS) Wingless Spec Sprint effort at Antioch Speedway during 1998-99. Shown here April 24, 1999 the date of his last win before cancer took his life later that summer. The Central State Racing Association Spec Sprints are pleased to announce the 2006 CSRA racing schedule. It will include 17 races beginning April 1st and ending September 23rd. Six races will be at Chowchilla Speedway and will be joint shows with NCMA and eleven at Twin Cities Speedway in Marysville with their Speedway Sprints. CSRA members will compete for the 2006 Championship Series which pays the top ten owners the points fund and top ten drivers trophies. The last two years the winning owner has received $1,000 and tenth place owner $200 awarded at the end of year banquet. The 17-race schedule allows CSRA teams that wish to run other race tracks time during the season to do so and allows teams that are on a limited budget to still compete for a championship. The rules for the coming season remain the same as last year including an open tire rule. You must be a CSRA member to receive points. An open meeting will be held to discuss rule changes that teams would like to see in the future that might pertain to this division. This meeting is open to all interested parties, not just CSRA teams and will be held Saturday, January 28th at 12:00 noon. A CSRA membership meeting will be held after this meeting at 1 PM, this meeting is open to all current CSRA members and anyone wishing to become a CSRA member. 2006 Officers will be elected. The meetings will be held at the Round Table Pizza at 4215 Norwood in Sacramento off I-80. For information on the meetings, directions, information on joining or about CSRA you can contact Richard Basden at 209-794-0801 or Steve Nelson at 209-257-1227 or by email at csraracing@prodigy.net or visit the CSRA web site at www.csraracing.com. Dan Gonderman & Travis Berryhill are given the one lap to green signal from flagman Dennis Daniels during the July 24, 1999 show...the 1st year of the WSS. 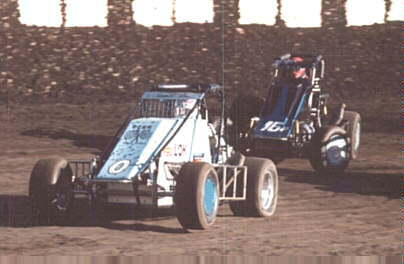 It all started at Antioch Speedway in 1999 when 12 drivers took the green for the 1st Wingless Spec Sprint main event. 7 years later almost 60 WSS sprinters showed up for the SPEC Sprint Nationals at Chico's Sliver Dollar Speedway. In all there are over 100 WSS cars in Central/Northern California. 2006 should be bigger & better...stay the course, good luck to all. Good Luck to all WSS racers in 2006. As most of you know I started this web site back when the Wingless SPEC Sprint idea started between Don Martin & myself back in 1999. Since than the class has continued to grow with Chico/Placerville, Marysville, Watsonville, CSRA, NCMA groups joining the original Antioch group. Since we are relocating to Indiana I've been debating as whether to keep trying to update this page or not. Since a few other sites have dropped our link and it's not as easy to get updates I'm opting to cease updating this page. I'll continue to be a Wingless SPEC Sprint, Wingless Sprint , Speedway Sprint, Modified Sprint, or what ever the WSS cars will be called supporter. I feel it's a great division and the rules really shouldn't be modified or changed as some folks feel. If it ain't broke don't fix it. I want to thank Don Martin, the man who helped make the WSS possible. Debbie Shipherd, for all her stories and photos though-out the years. Lance Jennings of SCRAFAN web site one of the WSS biggest supporters for all his coverage. I hope all of you will continue to visit the LOK Enterpriese web site as I'll updated it as much as possible. Jim Perry Jr. (15P) and myself do battle during the 1999 season.